The distributor's latest E4 event focuses on supporting integrators from product selection to project completion. The revenue from every dollar spent on a digital signage system must be divided among the vendors who make the products, the integrator who sell the system, the distributor who fulfills the orders, the architect who designs the installation, the artist who creates the content and various other possible contributors. In theory, these funds should be allocated in proportion to the value that is added by each member of the ecosystem. Over time, the value that is provided by each of these participants may be modified due to shifts in corporate strategy and changes in the overall business environment. For example, the primary value add of distributors has traditionally been based on physical logistics and order consolidation. The advent of more effective third-party logistics systems like FedEx, UPS and Amazon are driving down logistics costs, aided by more intelligent forecasting and planning systems. In parallel, automated ordering systems have reduced the cost and complexity of placing multiple orders, perhaps from multiple sources, eroding the value of consolidated ordering. As these costs go down, how does the distributor maintain their share of the revenue, or even attempt to increase it? Since distribution is a service, it is only natural that distributors find ways of increasing the value of their existing services while looking for ways to expand into new services. One of the challenges of large projects is the need to stage various products for deployment in various phases. Without staging, products in plentiful supply at initiation could go on allocation in later phases, jeopardizing deadlines. Almo Vice President of Marketing Melody Craigmyle described her company’s staging program that directly addresses this problem. They not only kit and ship the products as needed, they also defer invoicing until actual shipment, relieving the integrator of the need to float the cost of the products through the entire life cycle of the project. Craigmyle went on to describe Almo’s E4 series of regional events as another element of their strategy to add value to the distribution process. As the name implies, the value provided by these events focus on 4 E’s. The most prominent of these is education. Almo provides three ways to earn CTS credits: 1) by attending the seminars at any of their 4 E4 events, 2) by participating in live webinar-based sessions and, 3) by attending classes taught at their Philadelphia headquarters. These CTS classes are supplemented by their AV Snacks webinars that don’t quality for CTS credit but do provide quick insights into some of the most current issues in AV. According to Almo, the second "E" stands for Experts. By attending a local E4, it is possible for an entire integrator team to hear directly from industry thought leaders without incurring the time and expense of traveling to major events like InfoComm or DSE. The last two "E"s are Expo and Explore. 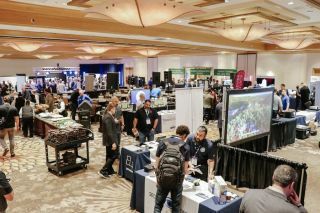 While somewhat redundant in meaning, Almo believes that attending their events enables you to see some of the latest products and practices in a much more convenient package. Jim Nista, Almo’s senior director of creative content explained that the final leg of Almo’s claim for value add is based on new services. This started with content creation services, giving technically oriented integrators the ability to provide artistic services and maintain a broader relationship with their clients. They have added templates, programming support and training to this mix, assuring resellers the ability to maintain those relationships with expanding services. More recently, they have added installation services, enabling the integrator to provide on-site services for their clients’ remote locations. As the entire industry knows, everything is moving onto IP, and many installations now depend on IoT services to maintain connectivity back to headquarters. Almo has added a collection of data, telephony and networking services to supplement the AV skills that are still the cornerstone of many integrators, helping to expedite the transition from aging AV infrastructures to the more universal IP platform. Is all of this enough for Almo to maintain their share of the revenue pie, and maybe even increase it? That will ultimately be determined by how much value these services provide in the eyes of the integrators.